Buy 3 Boxes and save $30.00 total over the one box price. Please Note: as the .22 Savage High Power is known in Europe as the 5.56x52Rmm, this cartridge is in the Metric head-Stamp. History of the .22 Savage High Power: The 22 Savage High Power cartridge was designed by Charles Newton and introduced in 1912 by the Savage Arms Company for the Model 99 lever-action rifle. It was very popular in Europe where it is known as the 5.6x52Rmm. It was based on the 25-35 case necked down to 22 caliber to increase velocity to over 3,000 feet per second. 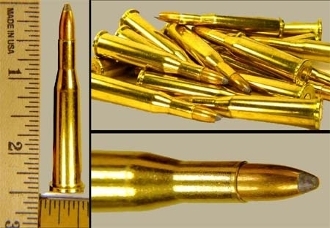 The caliber was widely used until the advent of faster varmint cartridges like the 222 Remington and 225 Winchester and it became obsolete in 1930; however, this is still a great varmint cartridge and still used today.